Long ago and far away, I went to nursing school. Not just any nursing school, but the atmospheric Queen’s University School of Nursing, where I was told I was too short to be a nurse, where I was almost fired as a student for questioning a prof, where I had to watch my nuclear-familied darker-skinned friend be questioned endlessly about her extended family while I, with my 21 uncles and aunts, was viewed as uninteresting in terms of family dynamics. There I participated in an urgent research study about how soon the mouth returns to normal temperature after drinking cold water. I did bed baths on bathing suited colleagues. I listened to the anatomy professor describe the female reproductive system while he stood on his bench with his arms extended as Fallopian tubes. It was an interesting intellectual experience, one that I didn’t fully plumb at the time, focused as I was on a. passing b. partying and c. being in love. It is not too surprising that I turned out a rather horrid nurse, clumsy and prone to mistakes, unsympathetic at the wrong times, and awash with grief at the right ones. But something got in my blood. Once a nurse, always a nurse, people say, and I think it is true. I may hate the thought of rising to meet the needs of my fellow man/woman/animal, but I can’t seem to help myself from doing it. When people faint at church, there are three nurses (me included) who run to their side. I hate being in crowds of excited overweight men, as I live in fear of having to do CPR. I almost killed a man once during an intimate moment and all I could do was review my code practices and strategize how I would get him to the hospital. 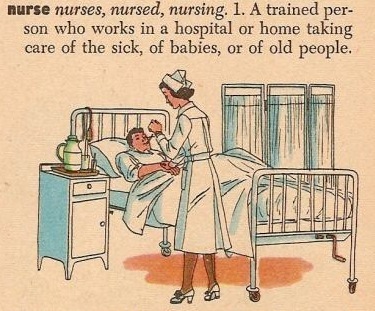 Some people, though, come naturally to the caring biz, even if they aren’t “nurses”. There’s a lass like that in my MS group of chums. She’s always extending herself for others, driving them to appointments, feeding them, cheering them on, arranging events, just being there. She’s not one of those offensive “busy ladies” either. She’s just there, comforting, sweet, caring, and present. She’s quiet, but speaks when she needs to. She has MS, too, and is exhausting herself as she tends to others, but is so necessary to those around her she dare not stop. She amazes me and I am humbled by her generosity of spirit. Me, I’d rather have a glass of wine and forget about everyone. Just don’t faint, or seem ill. Because then my inner nurse will take over, and wine or no, I’ll be there. It’s a reflex. Just like the rest of we nurses, trained or volunteer. We can’t help ourselves.